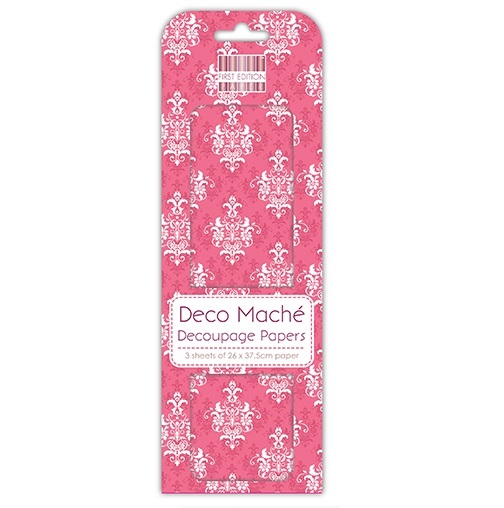 3 sheets of Deco Mache Pink Damask Decoupage Paper, these designs can be used to cover and decorate almost any item/ object. Transform old and new items with these beautiful decorative papers! To use the paper you simply want to tear or cut the paper into smaller more manageable pieces (Using big pieces of Deco Maché Paper can cause air bubbles to form under the paper. We suggest stamp size pieces for small items and 1.5 inch pieces for bigger objects!) Gently apply a layer of Glue to the item you are decorating with a brush, apply the paper onto the item and then use your brush to gently flatten it out, this will also apply glue to the top of the paper, sealing it down. Continue this, slightly overlapping each piece of paper so you can’t see the item underneath. Once finished leave your item to dry for several hours till no longer tacky and glue has dried clear, items that you want to use regularly such as Chairs and Coaster you can apply several layers of Varnish to your item, this will strengthen the paper making it perfect for everyday use, this can also be used on items going outside such as plant pots to make them waterproof. There are several varnishes available such as ‘Matt Finish’ and ‘Satin Gloss’ to give you different effects with your finished items.